Becton, Dickinson and Company (BDX), a medical technology company, develops, manufactures, and sells medical devices, instrument systems, and reagents worldwide. The company is a member of the dividend champions list, and has been able to boost distributions for 43 years in a row. The company’s last dividend increase was in November 2014 when the Board of Directors approved a 10.10% increase to 60 cents/share. The company’s peer group includes Medtronic (MDT), Baxter International (BAX) and St. Jude Medical (STJ). Over the past decade this dividend growth stock has delivered an annualized total return of 11.30% to its loyal shareholders. The company has managed to deliver an 10.50% average increase in annual EPS since 2004. 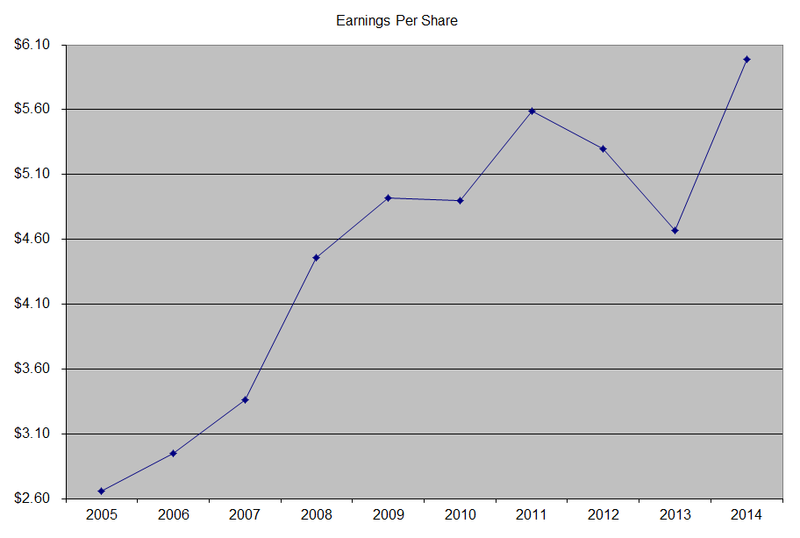 Analysts expect Becton Dickinson to earn $6.78 per share in 2015 and $7.42 per share in 2016. In comparison, the company earned $5.99/share in 2014. Becton Dickinson has also managed to repurchase plenty of shares over the past decade, bringing the number of shares from 263 million in 2003 to 197 million in 2014. The company is not expecting much in terms of share buybacks following the acquisition of Carefusion, in an effort to deleverage quickly. BD Medical produces a broad array of medical devices that are used in a wide range of healthcare settings. The primary customers served by BD Medical are hospitals and clinics; physicians’ office practices; consumers and retail pharmacies; governmental and nonprofit public health agencies; pharmaceutical companies; and healthcare workers. BD Diagnostics provides products for the safe collection and transport of diagnostics specimens, as well as instruments and reagent systems to detect a broad range of infectious diseases, healthcare-associated infections (“HAIs”) and cancers. BD Diagnostics serves hospitals, laboratories and clinics; reference laboratories; blood banks; healthcare workers; public health agencies; physicians’ office practices; and industrial and food microbiology laboratories. BD Biosciences produces research and clinical tools that facilitate the study of cells, and the components of cells, to gain a better understanding of normal and disease processes. That information is used to aid the discovery and development of new drugs and vaccines, and to improve the diagnosis and management of diseases. The primary customers served by BD Biosciences are research and clinical laboratories; academic and government institutions; pharmaceutical and biotechnology companies; hospitals; and blood banks. I like the fact that almost half of revenues is derived from items that are essential and disposable, and which creates the need for customers to repeatedly keep buying more syringes and needles to name a few. I like that the Diagnostics segment is also characterized by recurring revenue streams, as the customers would face high switching costs if they move to another competition. Becton Dickinson’s scale allows it to compete effectively in the Medical segment. Becton Dickinson should be able to generate higher sales in due to the sustainable demand for its diabetes products, disease testing products, and cell analysis products. The company generates almost 60% of its sales from international operations, which is expected to increase as it grows its presence in emerging markets. Becton Dickinson is also active on the acquisition front and is investing heavily in research and development, which should benefit the company through new product launches. Becton Dickinson has a solid long-term potential for its business, due to its strong position and due to the bullish prospects for its industry. The company enjoys strong demand for its products and a more favorable pricing than other competitors in its industry. The company is in the process of acquiring Carefusion (CFN) for $12.20 billion, most of which is going to be paid in cash. The deal is expected to close in the first half of 2015. Given the cheap rates at which cash is available, this acquisition is likely to be accretive since it is paid for mostly in cash. The main risk is that Becton Dickinson has never made such a large acquisition before, which means that there is some integration risk. The benefits include cost savings, increase in number of product offerings, improves scale and results in more access to different markets globally, including emerging markets. For example, the company expects to save $250 million by 2018 simply by reducing overhead and realizing efficiencies in manufacturing and operations. 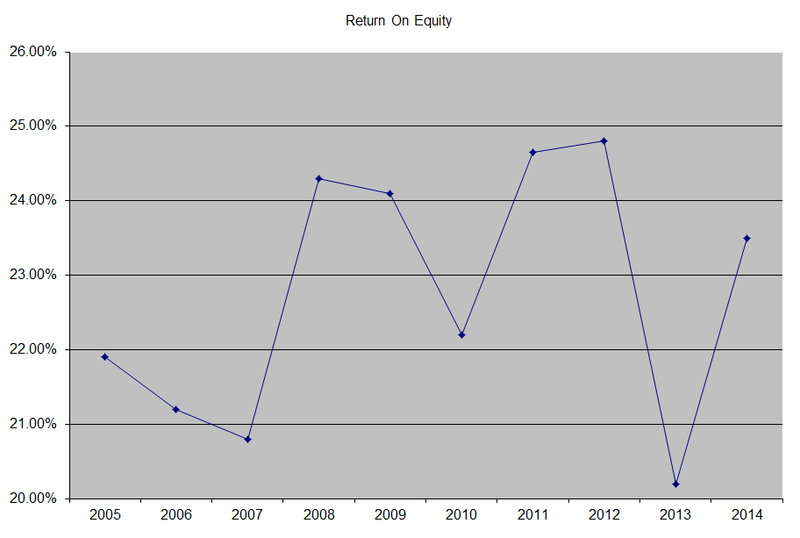 The return on equity has increased from 22% in 2005 to 23.50% by 2014. I generally want to see at least a stable return on equity over time. The annual dividend payment has increased by 13.70% per year over the past decade, which is higher than the growth in EPS. In my previous analysis I found that that BDX was one of the top dividend growth stocks for the past decade. 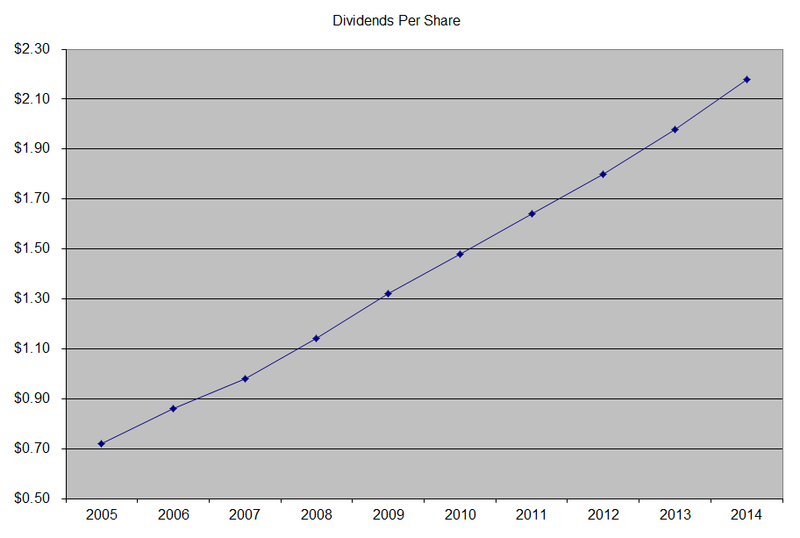 The past four dividend announcements were for a hike of 10% in dividends each time. Going forward, I would expect dividend growth to closely approximate 10%. A 10% growth in distributions translates into the dividend payment doubling every seven years on average. If we look at historical data, going as far back as 1975, one would notice that the company has actually managed to double distributions every six years on average. 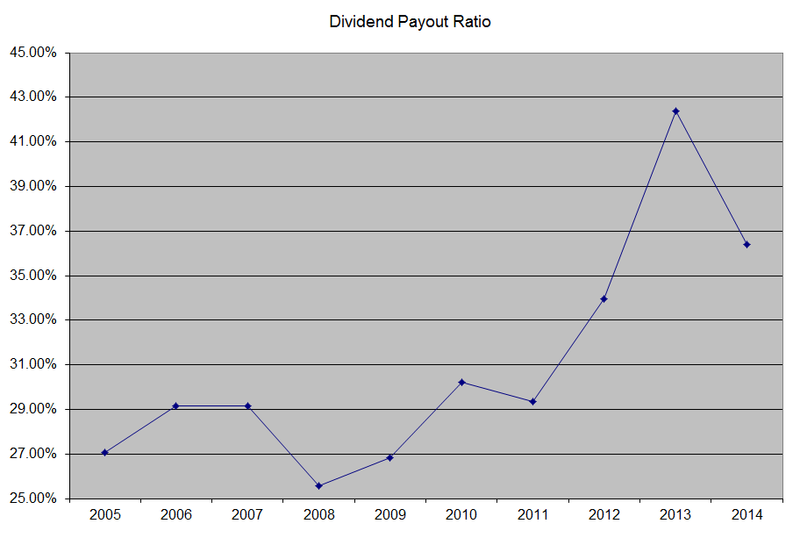 The dividend payout ratio has increased from 27% in 2005 to 42% in 2013, before falling back to 36.40% by 2014. A lower payout is always a plus, since it leaves room for consistent dividend growth minimizing the impact of short-term fluctuations in earnings. Currently Becton Dickinson is slightly overvalued at 20.20 times forward earnings, yields 1.70% and has a sustainable distribution. I initiated a small starter position in the stock in late 2013, after which the stock took off. This prevented me from adding more fresh capital to the company. As a long-term dividend investor in the accumulation phase, I get excited if the companies I am interested in are on sale, because I get to buy more shares with my limited amounts of capital. Although this price is a low probability event, I plan on adding to my position on dips below $96/share, equivalent to an entry yield of 2.50%. If I relaxed the requirement and required an entry yield of 2% however, I would need the stock price to fall below $120/share before adding more money to the company. - Should you sell after yield drops below minimum yield requirement?